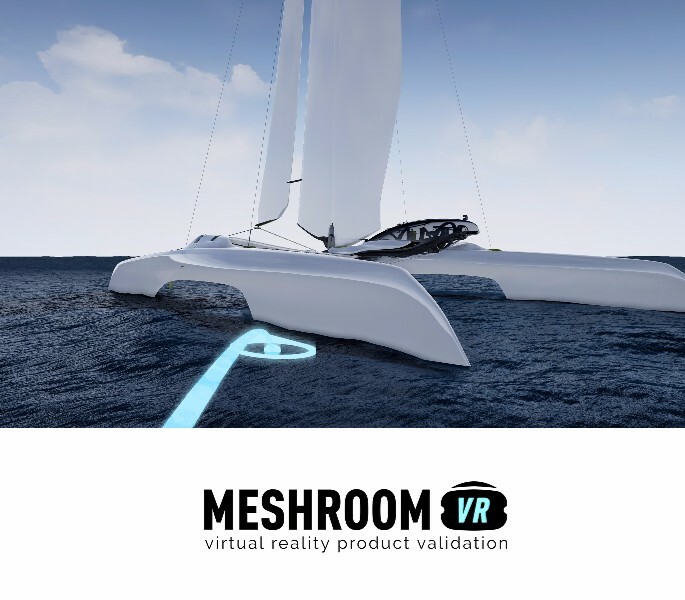 With Meshroom, designers can load detailed product models — such as a boat or plane for example — into a VR environment where designers and testers can view the product in actual 1:1 scale in VR and get a better feel for what the product is like before it is actually built. They can also see whether any part of the design does not work, for example, parts that would bump into each other, or if cables would be bent too sharply. This allows designers to avoid costly mistakes in producing prototypes and it also speeds up the prototyping process. To be honest, I don’t know much about design validation and I took it for granted that this kind of use for VR was common. It turns out that according to the developer, it is more challenging than I had assumed. The problem is that when real models are used — the same models used to manufacture the product — the detail (number of polygons) is usually so high that standard VR software would get overwhelmed and would not be able to display the model smoothly. Meshroom VR however is able to use modest hardware (a laptop with GTX 1070, according to the developer) and through proprietary techniques enable a smooth display of models with as many as 5 or 6 million triangles. In the demo I tried, I saw a detailed model of a small plane and experienced what it was like to be in the cockpit of the plane. Designers would be able to see if there was enough room, or if the windows were large enough to provide good visibility. In addition, Meshroom can also be used to display high resolution 360 photos, with control over its scale, and even the ability to change the position of the virtual sun (with realistic changes to the shadows). According to the developer, design validation systems ordinarily cost many thousands of dollars. Meshroom VR, however, can be licensed for €2388 per year, and it runs on HTC Vive (reviewed here) which is now available for $599 (compared to $799 when it launched). Please note: according to one of the developers, Meshroom is not designed to run on Oculus Rift (reviewed here). He claimed that it was because HTC Vive is easier to setup for roomscale VR (which is true), but to me it doesn’t make sense to exclude a significant portion of the VR headset. In any case, I believe Meshroom is a perfect example of why VR is here to stay: regardless of whether it is widely adopted by consumers, it is an essential tool for certain industries. Related post: 360 video of LAX shows VR’s usefulness outside of gaming.